This tour has been curated by Sarah Norton and Joshua DeBoom in celebration of the United Nations observing 2015 as the International Year of Light and Light-Based Technologies. Following the links below will take you briefly through the evolution of our understanding of the nature of light. Simply click on the image of an object, or its title, to be taken to its webpage. Each page contains an audio file you can listen to, along with the full transript for those who would rather read, and photographs of each object. Navigation between webpages is easy, with links at the bottom of each page taking you to the next object. The items in the tour can be found in the room by looking for the fluoro yellow markers that accompany them. 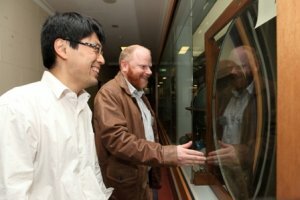 We at the UQ Physics Museum hope you enjoy the tour. Don't forget to check out some of our other tours which can be found on the homepage of the website!